If building a set of stairs is on your project list, but you’ve never done it before, read here to learn about the various terms used to describe the parts of the stairway. Knowing the terminology before you start building gives you an upper hand when it comes to implementing the plans. Many skills have specific terms that apply to them. Conversing with someone else about those skills and using the correct terminology makes communication easier. The same is true of stairway building, with an added twist. 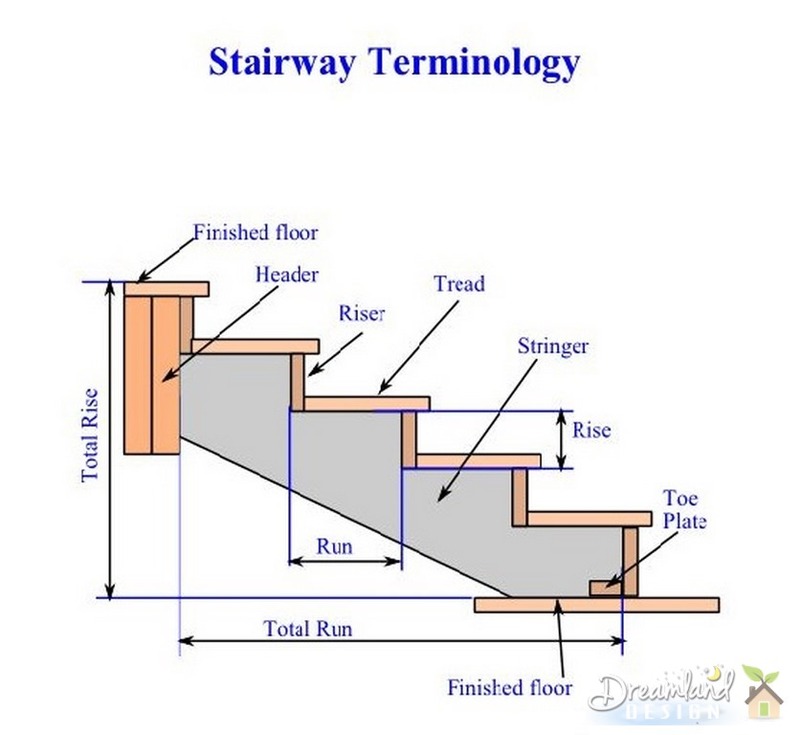 The terms that builders use to describe a stairway and how to build one are different from the everyday terms that people use. Often, the terms used by builders have different meanings for the casual user. If you’re planning on building a stairway, you need a good understanding of stairway terminology, what the terms mean, and how to incorporate that knowledge into building a stairway. Step or Stair – A single step or one unit of rise. You put your foot on a step and lift yourself up or down with your leg muscles. A complete set of steps makes up a stairway. Stairway, Stairs – A series of steps that allow you to ascend or descend one at a time to move from one level to the next. The terms include the enclosure the stairs, whether they are railing assemblies or walls. Staircase – Similar to stairs or a stairway, except a staircase is a finished piece of woodwork complete with a balustrade railing assembly. Stairwell – The enclosed space of a stairway that begins at the top of the finished floor of the upper level and extends upwards to the ceiling above the stairs at the top of the stairs and is enclosed by the front and side walls. There are five main measurements that affect building a stairway. Total Rise – The total amount that a stairway rises from one level to the next. The measurement is taken from the finished floor on the lower level to the finished floor on the upper level. Total Run – The horizontal length of the stairs, measured from the front of the top landing to the base of the bottom riser. Rise – The vertical distance each step rises above the previous one, measured from the top surface of one tread to the top surface of the tread above it. Each step must rise the same amount as the others with no more than 1/4 inch difference measured between any two steps. Run – The horizontal distance of each step, measured from the front face of the riser to the front of the tread nose. Headroom – A measurement taken on enclosed stairways when the wall that faces the top of the stairs is positioned over the stairway. Head space is the vertical distance between the bottom of the upper floor framing and the top of the tread nose directly beneath it. Building codes specify the amount of headroom at a minimum of 80 inches. Rise Over Run – A term that describes how much the stairway rises for a specific distance. A stairway with a rise height of 7 inches and a run length of 11 inches has a rise over run of 7 over 11. Using basic trigonometry, you can calculate the stairway angle. Divide the rise by the run and apply the inverse tangent function to the result on a scientific calculator to find the angle between the stairway and the lower floor. This calculation is generally unnecessary, but may be useful when cutting handrails. Stringer – A stairway support member cut for each tread and riser. A closed stringer is not cut, but has brackets installed to support the treads. This type of stringer is also called a carriage. Tread – The part you put your foot on. The back of the tread rests against the riser or the riser cut out on the stringer. The bottom of the tread sits on and is fastened to the stringers. Tread Nose – The front of a tread that overhangs the step below it. The tread nose is miter cut on the open side of a staircase to allow another piece of tread nose to turn the corner and run along the outside of the tread, hiding the seam between the tread and the skirt. Riser – Encloses the back of each step. Usually the riser is between the stringer and the tread, but not always. An open riser leaves the space open and is not actually a stair part, but the absence of a riser. Toe plate – This is positioned between the stringers on the floor at the bottom of the stairs. Some carpenters notch the bottom of the stringers to fit a single toe plate under them. The toe plate fastens to the floor and prevents the stringers from moving. Header – The floor framing the stringers attach to at the upper floor. The header is not just a part of the stairway, but an integral part of the house framing that supports the floor joists along side the stairs and also bears the weight of the stairway and the people using it. Ledger – Some carpenters attach stringers to the header with a ledger board. The stringers attach to the ledger and the ledger attaches to the header. Check with your building department before using this method. Railing – Railings are often confused with handrails. A railing provides an enclosure on an open stairway to prevent someone from falling off. Handrail – The handrail gives the stair user something to hang onto and steady themselves. 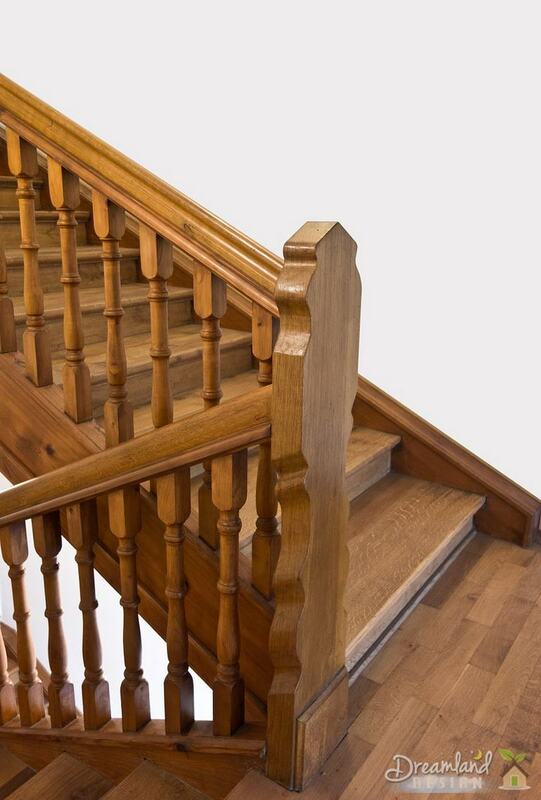 Balustrade – A finished handrail and railing system incorporated into a single piece of woodwork that includes posts, balusters, railings and a handrail. Skirt – A piece of wide molding cut to fit around the steps on a staircase. On the wall side of a staircase, the flat edge of the skirt is above the treads and hides gaps between the wall and the treads and risers. On the open side of a staircase, the risers are miter cut to fit an opposing miter on the skirt rise. A stairway may also have a skirt board that adds additional strength to the stringers.